Summary: Seventeen-year-old Ismae escapes from the brutality of an arranged marriage into the sanctuary of the convent of St. Mortain, where the sisters still serve the gods of old. Here she learns that the god of Death Himself has blessed her with dangerous gifts—and a violent destiny. If she chooses to stay at the convent, she will be trained as an assassin and serve as a handmaiden to Death. To claim her new life, she must destroy the lives of others. Assassin Nuns. That was all I needed to hear in order to persuade me to pick Grave Mercy. Assassin Nuns who serve the god of Death. What an interesting and original premise. Grave Mercy is a cross between historical fantasy and fantasy. Which are two of my favorite genres, so I was super excited and I was not disappointed at all. Ismae is a girl who was taken from a very hard situation and put in a very different but also hard situation. She was such a strong character but she had her flaws and insecurities that made her feel real. Also her transformation from a girl who just blindly follows the guide of others into a woman who makes her own decisions and judgment was really fascinating to me. This is because I think it is a transformation that many people have to go through before they can come into their own. Duval oh Duval. I loved Duval he added so much mystery and intrigue and like Ismae I never quite knew whether to trust him or not. 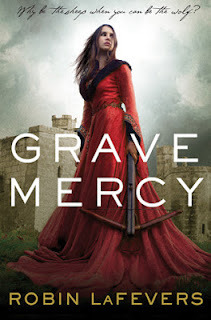 Being that Grave Mercy is historical fantasy there was tons of intrigue and back-stabbing to keep you interested even if you aren't the biggest fan of historical fiction (why not?) all the court politics were tinged with treason and yearning for political gain. I loved how seamlessly the assassin nuns storyline went along with that. Basically Grave Mercy was romantic, intriguing, and just all around awesome. I cannot wait for the next book! Fun review!! I love Grave Mercy - for all the reasons you mentioned!! Tons of intrigue and great characters. I'm a new follower on Twitter & your blog. NICE!! !